It feels almost as if the plots are holding their breath, hanging on to one last bit of warmth before winter advances. 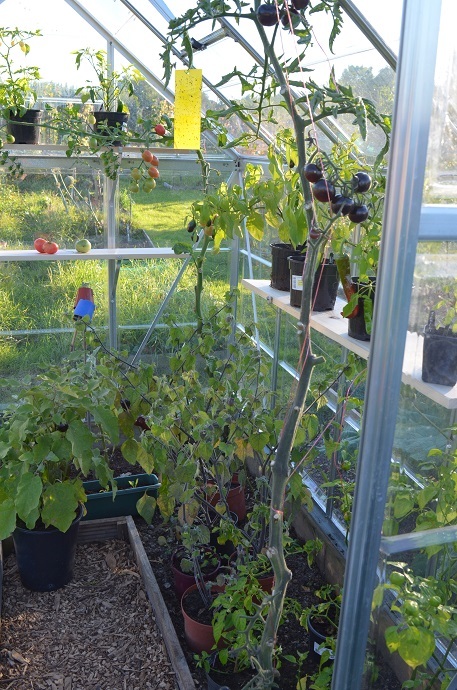 The greenhouse looks strange and very bare without tomato plants looming to the rafters. It feels slightly odd to be able to get in without sidling round trusses. I’ve treated myself to some new 4ft planks as shelves (oh, giddy heights!) and have brought in all the plants I want to ripen fruit from. We shouldn’t get frost for at least another 3 weeks, but just in case…I do need to get a handle on how much I can fit in there over winter. I keep telling myself that this or that can go in to be sheltered, and I think I’ve forgotten it’s not the Tardis. I’ve started making labels ready for the packets of seed I am saving this year – hours of careful fun with a scalpel and a metal ruler. There will be quite a lot if all goes well but I am not keeping all the seeds. 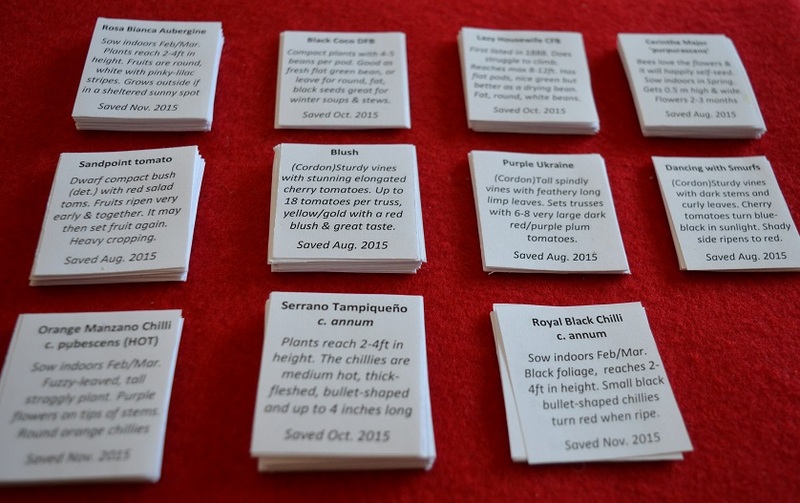 I’ve been viability testing some old chilli seed for the GYO Virtual Seed Parcel (worth looking through! ), growing beans for the Heritage Seed Library and I’m in a few seed circles of varying sizes and specialisms. One’s just for tomatoes. 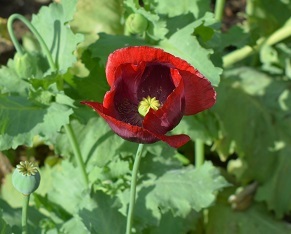 The poppies are out and are glorious. These are from a late July sowing and were stuck in the middle of the sweetcorn to give them some shelter while they were tiny. Only 5 plants have made it past the hungry slimies. Next year I really must sow more. I won’t get more than a tablespoon or two of seed from these, but even one batch of poppyseed rolls will be lovely. 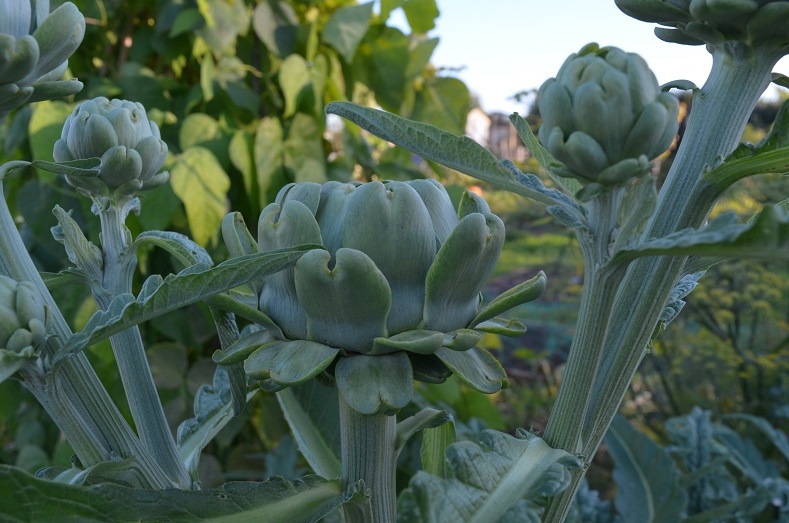 My artichokes, too, have had a late surge in the warmer weather and are producing a second set of flower heads. This time they’ve been tasty and haven’t been bitter at all. I’d assumed they would be dieing down now, ready for winter mulching, but apparently the warmer autumns are making the plants behave differently and green growth will go on quite late. I am anxiously watching forecasts for frost warnings. 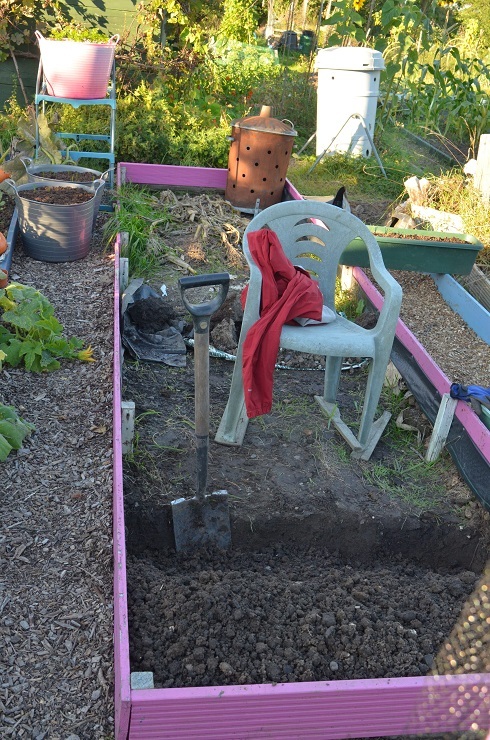 The plots are in something of a frost pocket, and my squashes & beans need more time to ripen. After a slow start it looks like I am going to have an ok harvest. Mostly by dint of having a ridiculous number of plants. The Shishigatani squash are even trying to produce baby fruit now. I don’t think they have a hope of getting to mature size, but I don’t need the space, their one mature squash was picked a week or so ago and I may as well let them try. My hand-pollinated Jarrahdale squash fell off though. I don’t know what went wrong – it was fairly big. My shed is festooned with bags of drying herbs, seeds and seed pods. It cheery and it looks like every shed I have ever imagined, but a bit messier. I love that it smells of sage. Otherwise I am counting saffron flowers as they pop up, slowly digging next year’s potato bed and closing down beds as crops come to an end. 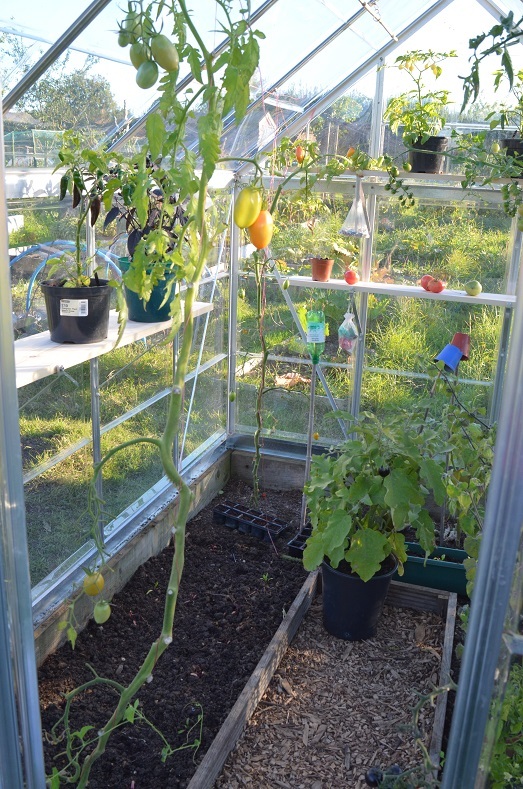 I must sow some salads for winter this weekend, and put in the garlic – Extra Early Wight and Tuscany Wight this year. remember never to plant the garlic in the same place. The garlic farm in the Isle of Wight don’t have any field of their own and rent different fields every year. They told me that even after 20 years there can be traces of the virus that is carried by garlic. Thanks John, good tip. I didn’t realise that about the Garlic Farm. I didn’t grow any this year (didn’t get organised in time) so I have plenty of different options for this year.